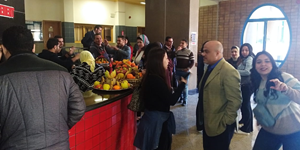 The faculty of Tourism and Hotel Management held a fruit festival on Tuesday, 19 March, 2019. This was held from 12.30 pm to 2.30 pm at the foyer of the Social Studies and Humanities Building. The event was held in the presence of Prof. Amany Refaat, the Dean of the faculty of Tourism and Hotel Management, academic staff members and 75 students.